I'm always on the lookout for interesting side dishes that are both healthy(ish) and tasty. Obviously, potatoes, rice and pasta are delicious, but they are also pretty monotonous and I like to find ways to increase the fibre and the nutrition in the side dishes I make. And frankly, a person can only eat so much quinoa. Of course, some would also argue that a person can only eat so much kale, but I'll beg to differ on that. One of the things I love about kale is how it is a bit of a chameleon - depending on how you prepare it, it can be a completely different beast from one way to the next. I love kale in a salad, because it holds up to dressing so well, and the chewier texture and bold green flavour make me happy. Kale caesar is pretty much my favourite, though I will admit you essentially negate any healthful benefits when you douse kale in bacon, parmesan cheese and caesar dressing. I also love kale chips (hubs and the kids hate 'em though). I'm not on the green smoothie bandwagon, but I'm told kale is not terrible that way either. My other trick is to chop it up finely and use it as a bit of a disguised ingredient. 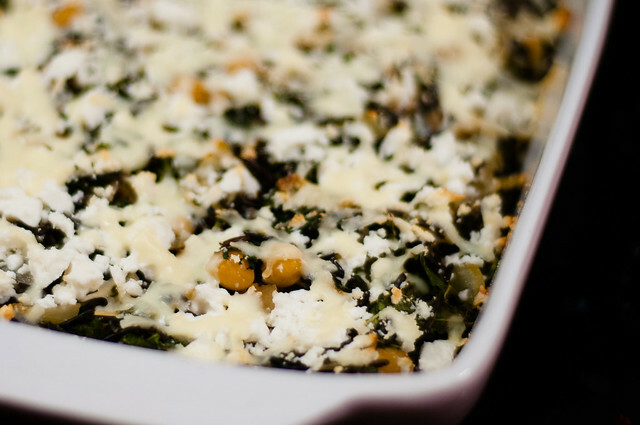 This gratin recipe came together because I had some semi-wilty kale and wasn't really sure what to do with it. It wasn't fresh enough for salad, but it certainly wasn't beyond the point of redemption. 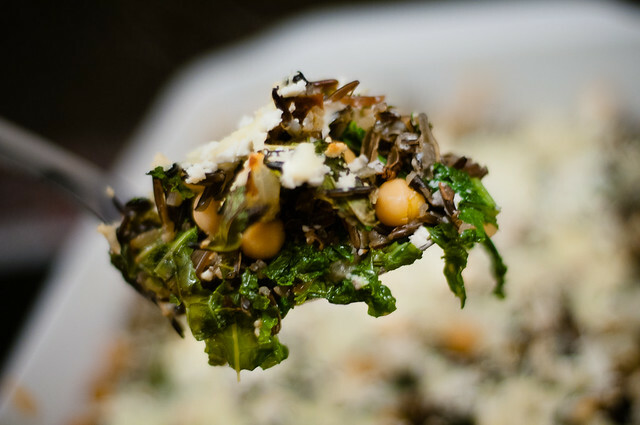 So I started googlng various recipe ideas and came across a wild rice gratin that had a healthy serving of kale in it. Necessity and taste being the mother of invention, I had to make enough changes to this that I think it's worth re-posting as a new recipe. 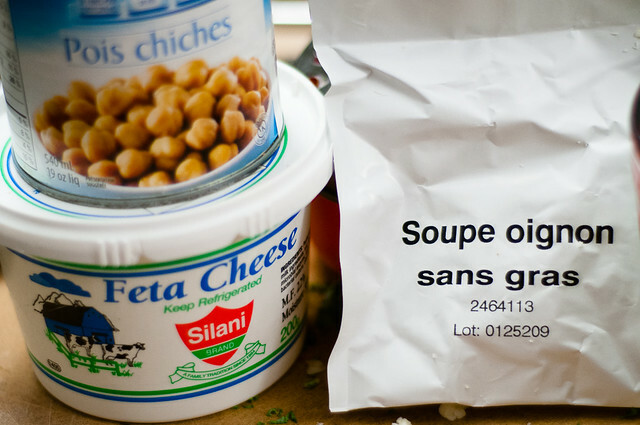 I added chickpeas because we love them (mini-foodie 2 has an addiction), and instead of gruyère, I used a combination of mozzarella and feta, skipped the panko (I don't like breadcrumbs on top of casserole dishes), cut the butter down, and had to sub the broth with onion soup mix. As terrible as it is, I have a soft spot for this stuff - I just use 1/4 package. You could easily use 1 c broth and 1 t minced dried onions for similar flavour. I LOVED this dish. It wasn't fast, because wild rice is not quick, and neither is caramelizing onions, but I will say that it's pretty low-maintenance once you have it going (neither wild rice nor onions require a ton of attention if you keep the heat low). 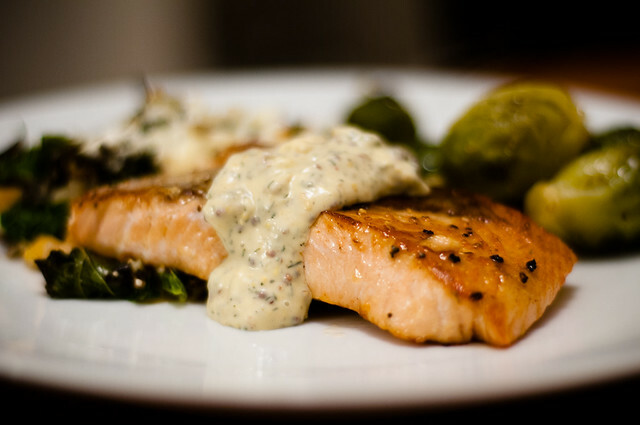 You could easily make this ahead (a day in advance) and pop it in the oven before dinner. I used a pretty lilac casserole dish, by any small casserole dish would work (9x13 would be too big - mine was about 7x10 and was perfect). 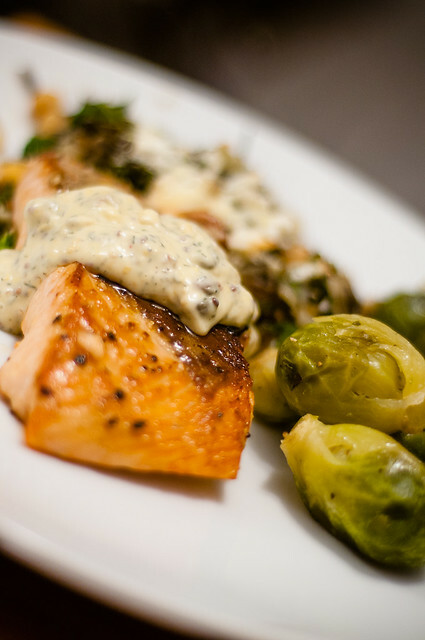 I served this with roasted (frozen) brussels sprouts, which I just tossed in a touch of olive oil, salt and pepper, and baked for the same amount of time as the gratin, and with pan-seared salmon fillets and a quick lemon-caper mayo (sauce recipe follows). 1. Combine 4 cups of water with rice and bring to a boil. Cover and simmer for about 40 minutes, until many of the grains of burst and the texture is chewy but enjoyable. 2. Meanwhile, heat a large skillet with the olive oil and butter over medium-low heat. Add the onions, salt, pepper, and turn the heat close to low. 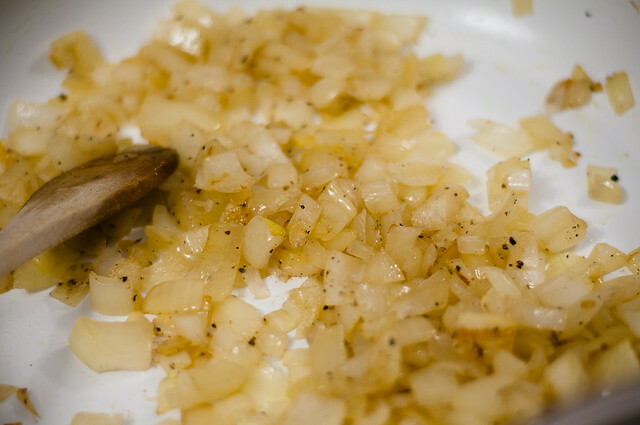 Caramelize the onions, which will take about 30 minutes or more. 4. Add the kale to the onions and cook until the kale wilts, about 5 minutes. 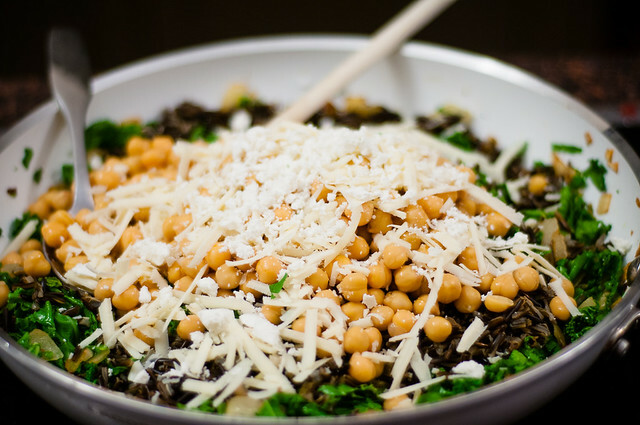 Stir in the wild rice, chickpeas, 1/2 the cheese and the water/soup mix (or broth). Taste and see if it needs more salt and pepper. Adjust to taste. 5. Spread into the casserole dish Add the kale ribbons, and cook until they wilt, about 5 minutes. Stir in the wild rice, 1 cup of the grated cheese, and the broth. Taste and season with additional salt and pepper if needed. 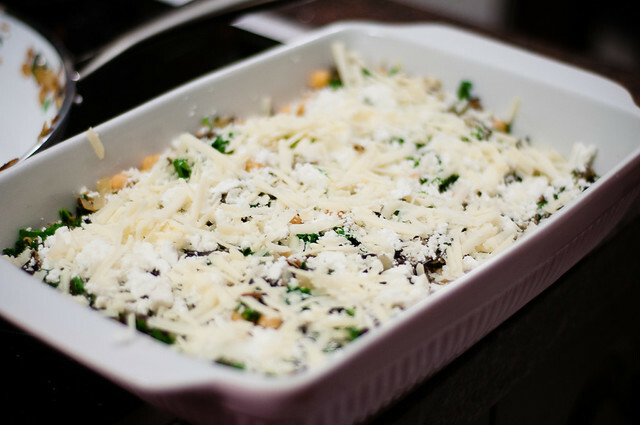 Spread the mixture into the prepared dish, and sprinkle with the remaining cheese. 6. Bake until bubbly and beginning to brown, 30 to 35 minutes. Serve. Combine all ingredients in a bowl. BAM - you're done. Don't add too much salt because the dijon, mayo and capers are already fairly salty; err on the side of caution. This meal was pretty delicious! The kids LOVED the salmon and didn't mind the side dish (my youngest is obsessed with beans of all kinds and gobbled the chickpeas). As you'd expect, they weren't enormous fans of the brussels sprouts, but that won't stop me from serving them - I don't force or set 'minimum consumption,' but I do offer, they know they can't tell me they don't like something without actually tasting it. I've ranted before about picky kids (ironically, before I had kids...), and I will maintain that if you only offer foods within a small comfort zone, kids will never expand their horizons, and will never become less picky. Even if kids don't necessarily like something, I think it's important to keep offering a wide variety of foods. One of my favourite blogs, It's Not About Nutrition, has a ton of great advice for dealing with picky kids and helping them expand their palates.